PRETORIA, South Africa – In the hours after Paralympic star Oscar Pistorius shot and killed his girlfriend Reeva Steenkamp, Col. Giliam Schoombie van Rensburg was collecting evidence when he heard a gun being cocked behind him. Van Rensburg says he turned around to find the police ballistics expert, gloveless, with Pistorius' gun in his hand, having removed the magazine. "So, I asked him, 'What are you doing?' 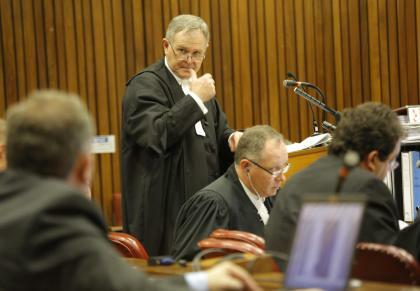 " van Rensburg said on the witness stand Friday as the trial of Pistorius entered it's 10th day. The officer then looked down and realized he was not wearing gloves. "And then he said, 'Sorry,' " the colonel testified, adding that the ballistics officer put the magazine back in the gun and laid it back on the bathmat, before pulling on the gloves in his pocket and picking it up again. "I was very angry," van Rensburg told the court. It was police bungles – such as this – that found the limelight Friday. There were questions about conflicting police accounts, more allegations of possible tampering – accidental or otherwise – and a moment of glowing embarrassment where the prosecution appeared to have discredited a defense theory only to have it blow up in its face. That came when defense attorney Barry Roux questioned the reliability of forensic photographs of the scene. Pointing to images of a second iPhone found in Pistorius' bathroom, Roux accused the forensic team of moving the item before photographing it. Van Rensburg remained adamant that he had not noticed it, adding that it had been entirely obscured by a bathmat. Roux then showed a number of photographs of police working in Pistorius' bedroom, questioning whether anything had been tampered with prior to the forensic photographs being taken. "When can we rely on the scene photo to be a true reflection?" Roux asked. Prosecutor Gerrie Nel triumphantly noted that the metadata contained in the photographs would prove their timeline, requesting to have it displayed on court monitors – only to show that the camera used had the date incorrectly programmed as April 2008. Earlier, when confronted with conflicting statements of several colleagues from Valentine's Day morning last year, van Rensburg found himself again shaking his head. The colonel insists he was the first officer to arrive at Pistorius' home, yet Roux read a statement detailing how another officer had arrived on the scene before him and followed the blood trail before providing a perfect description of the bathroom where Steenkamp was shot. "Amazing," van Rensburg said as he listened to Roux, laughing disbelievingly. "I say, it's amazing, because he was not there." The colonel speculated that the statements might have been made on hearsay, "because he [the officer in question] was not in the bathroom. He was not on the first floor at all." Van Rensburg, who left the police service in December 2013, said several details in all three of the officers' statements Roux read in court – including one from controversial detective Hilton Botha – were wrong. Botha, the original lead investigating officer on the case, was removed and replaced days after he crumbled under Roux's cross-examination during Pistorius' bail hearing in February last year. The detective, reduced to a stutter, admitted then to having "run in" to the scene without proper protective footwear. For added humiliation, a police spokesperson at the time confirmed that Botha and two other officers also faced attempted murder charges themselves, after being accused of firing at a taxi carrying seven passengers during an allegedly drunken incident in 2011. Botha has since also left the police service. Van Rensburg, the former commander of the police station nearest Pistorius' home, recalled "100 percent" his discovery of blood spots leading up the stairs and into the athlete's bathroom, in the early hours of Valentine's morning last year. He said he followed the trail in the company of Botha, while a "very emotional" Pistorius, unable to describe what had happened, waited in the kitchen. Botha's statement, on the other hand, suggests he arrived much later, after van Rensburg had done an initial inspection of the scene, and only when Pistorius was being photographed in his garage. Courtroom GD's monitors again clicked through image after image of the bloody bathroom, including a close up of Steenkamp's blood in the ceramic toilet bowl. But the photographic presentation also showed a shirtless Pistorius, wearing damp grey shorts and blood-streaked prostheses, his arms crusty with dried blood, in the hours after he had shot Steenkamp in the head. In the photograph, his right shoulder is strapped with red tape, seemingly confirming the defense assertion that he had a sports injury there. Van Rensburg says the police had initially informed the athlete that he was a suspect, before arresting him later that morning, when they found a "prima facie case against him." Roux took van Rensburg through the timeline of his movements on Valentine's morning, repeatedly asking, "Where was Hilton Botha? ", who it appears was left alone in the bathroom on several occasions. Van Rensburg has also come under fire after it emerged last year that he had kept Pistorius' toilet door in his office at the police station instead of in secure evidence storage. He says he ordered the removal of the door from the scene after hearing media offers of up to $6,000 for a photograph of the "most valuable evidence" item. The door, which Pistorius fired through killing Steenkamp, was sealed in the biggest body bag he could find, van Rensburg said, to prevent contamination. He says it was kept in his office because the charge office had run out of space and he did not want to damage the evidence by cramming it into storage. Van Rensburg says he signed for the exhibit and insists his office was secure as he was the only officer with a key. The door remained there for the rest of the month. In cross-examination, the balding colonel eventually admitted, after having to correct his statement several times, "I didn't focus on the nitty gritty. There may be small things … and bigger things … that I didn't notice." But, while the bungling may be embarrassing for the country's police service, a legal expert says – from what has been presented in court – it may not have as large an impact on the state's case as one might imagine. Much of the evidence affected by the alleged contamination so far is already common cause, agreed by both sides. "Obviously there's a serious concern regarding the protocol followed by the police, and the manner in which they conducted the investigation and collected forensic evidence, but this is not the beginning and end of the prosecution's case," Llewelyn Curlewis, the President of the South Africa's Law Society, told Yahoo Sports. Curlewis says Judge Thokozile Masipa, who will render a verdict in the case because there is no jury in South African court, may be inclined to disregard some of the evidence and testimony if she does not feel it to be reliable, but it may not change the outcome. Curlewis says the admissions from both sides, along with Pistorius' detailed bail affidavit and plea explanation, mean that unless a particular piece of evidence directly relates to the athlete's defense, much of the debate around discrepancies or contradictions in testimony will have little impact. For example, while the contamination of the gun exterior is a point of concern, it is not in dispute that Pistorius was the person handling the gun and therefore is unlikely to impact greatly on the judge's deliberation, Curlewis says. But it is certainly impacting the reputation of the police. Amongst the collection of forensic photographs are several shots of Pistorius' expensive watch collection – nine, including some Armani pieces, and another worth up to $10,000 – eight of which were kept in a glass display box. Roux says two of the watches went missing after police arrived. Van Rensburg, in his testimony, repeatedly spoke about how he asked the forensic team to take care of the watches, "because I could see they were expensive and I thought they might be tempting for someone," but in the hours after the shooting, he admitted one of them disappeared. He says they body searched all personnel, bags and vehicles, but could not find the watch, and opened a case of theft. All the other watches have since been returned to Pistorius, van Rensburg said. He insists access to the scene was controlled and the house was sealed properly with tape and plastic cable ties each day during the investigation. "At no stage was the door seal broken or tampered with," he told the court. He says the police locked doors and windows, even ensuring that food for Pistorius' two dogs – a bull terrier and a pit bull – was given to the gardener, who lives on the property, so he would not need to access the house itself. The gardener – whose keys were also confiscated – is also reportedly on the witness list. Pistorius remained composed throughout the afternoon, sporting a new haircut, even after thumbnail photographs showing close-ups of Steenkamp's face and injuries again accidentally flashed up on the court monitors before the computer cable was hastily pulled out. Forensic expert Col. Gerhard Vermeulen will return to court next week when proceedings continue, after the defense team said it had noticed several other marks on the toilet door – which remains erected in court – it would like him to examine. Court officials have confirmed that evidence in the trial will continue to be presented until the court goes into recess on April 4 – an extension of two weeks – unless both sides complete witness testimony before then. "Now it's a tennis match," Curlewis told Yahoo Sports, "and no one's obtained the first set yet."